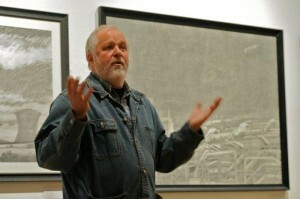 Dave has his work in many private and municipal collections. Her Majesty the Queen’s Royal Collection. 1986 Major Commission ** The Area Museum for the South west of England commissioned me to produce ‘on site’ works at all the leading ancient sites from the Scillies in the West to Stonehenge in the east. The commission took two years to put together and toured the west country for eighteen months. The archaeologist Aubrey Burl wrote the text to accompany the works created which toured the following place- Truro, Bristol ,Falmouth, Devizes, Taunton, Cheltenham, Salisbury and Woodspring Museum Weston-Super Mare. 1987 One Man Show Wolverhampton Art Gallery called Stonelines. This was a massive exhibition showing over eighty works. 1987 Commission** in co-operation with National Museum of Wales to work ‘on site’ at all their leading ancient sites. Took two years, over ninety works were made. They never toured as intended due to lack of resource from the Welsh Museum system. National Museum saved the day by purchasing several for their permanent collection. All this work to date has not been seen in Wales. project at the last minute. All the drawings made of the limestone mining were never purchased as promised. All very political because of the caverns being ‘in filled’ at the time. 1994 One Man Show Wolverhampton Art Gallery linked in with ‘Scratching the Surface’ exhibition a residency with Colton Hills School in Wolverhampton.Fist massive residency combining music, ceramics, sculpture, on ‘site drawing’ over 600 students works were exhibited with 20 of mine. 1996 Commission** for Bilston Art Gallery for their Interpretation/ History Gallery several works showing the changing landscape around the new Black Country Route. 1999 Commission*** Walsall New Art Gallery to make a mixed media work from the gallery roof looking at the West Midland Panorama. The finished work took two months to complete and will be permanently installed into the Interpretation Galley A flip book of me drawing, and an interactive CD Rom makes for exciting listening and looking! 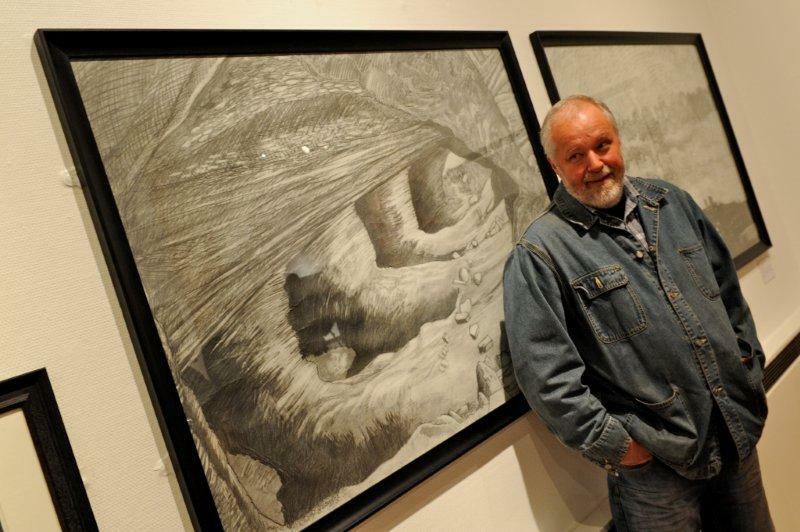 2000 One man show Washington Gallery Penarth South Wales ‘Gunning in Wales’ landscapes/ancient sites. 2000 The Rolf Street Project Black Country Museum Work for the new museum. 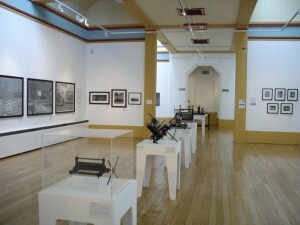 2000 One Man Show Stafford Art Gallery[Shire Hall] Panorama from the Shire Hall Roof & latest monument work. End 30 Sept.
2000 Elected Assiciate Member of the Royal Society of Birmingham Artists. 2000/2001 Year of the Artist Award from the British Arts Council to produce a six steel panel etched instillation as a memorial to the workers of the West Midlands. The finished work will be installed in Bilston Craft GalleryWest Midlands. Project happening now until December. The work ended was exhibited here for 18 months instead of three months! 2001 Working in New York. 2002 New York Arts Expo [March] Steel etched panels, drawings and paintings. 2002 One Man Show Devizes Museum Wiltshire. [June] Many Journeys, Many Megaliths. 2002 Working in Cyprus drawing the many tombs there. 2002 Working Northern Ireland. Sligo. Carrowmoor Burial Complex. 2003 Crown Nail Polished steel etched fence project. 2003 Crosby Coatings Steel gates commission. 2003 Group show ‘Earths Teeth’ Sibford. Oxfordshire. 2003 Exhibiting Wine Street Gallery. Devizes .Wiltshire. 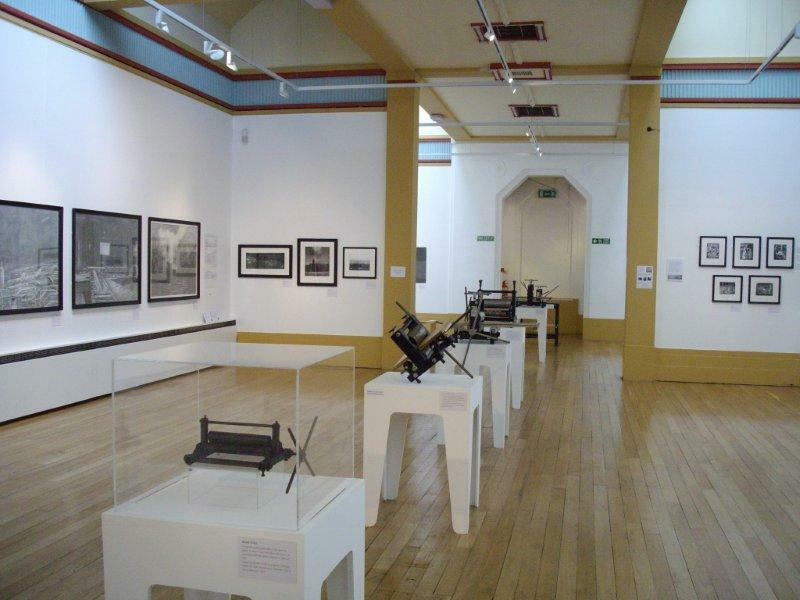 2003 Walsall Print Show. ‘Print matters’ Walsall New Gallery. West Midlands. May/June My image used as centre piece for poster invites etc. 2004 Exhibiting Wine Street Gallery. Devizes Wiltshire. 2004 Working out in Korea at Bronze Age dated burial chambers. 2004 Exhibiting Silk Top Hat Gallery. Ludlow Shropshire. 2006 Working in the French Alps looking at Mt Blanc and surrounding landscape. 2006 Working in Cyprus looking at castles in the north, tombs and settlements. 2006 Residency St Mary’s Junior School, Hempstells Junior School, St Chad’s Junior School and Pye Green Junior School– Creative Partnerships Residencies– Dave worked boys producing drawings, prints and large steel etched sculptures in the four venues. 2006 One Man Show –Ironbridge Waterloo Gallery. 2006 Permanently available in my own Church Hill Gallery Ironbridge. 2007 [ongoing now] Commission and Residency Ironbridge Coalbrookdale Infant and Junior School– to develop drawing, and printmaking with the children to help create and design decorative images for steel etched panels . Dave has been commissioned to create four steel constructed arches which will hold 64 acid etched polished steel panels. The archways will create an attractive entrance to the Dale St side of the school. 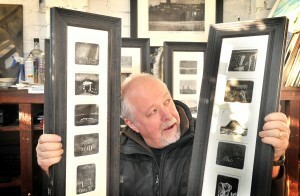 Dave is also making four large steel etched plates which will have images of local industry and landscape. The larges plate will be permanently attached to the fence between the archways. 2007 October Exhibition of Korean works at the Kangwhagon Festival South Korea. 2007 World Heritage exhibition Organizer and exhibitor. [Sept 2007] Four week exhibition highlighting Ironbridge Artists. 2010 First Retrospective Exhibition. Devizes Museum Wiltshire. [ July– October] Workshops with local schools at Avebury. London Gunning & Gunning Show September 10th—17th The Hepsibah Gallery, Hammersmith London. 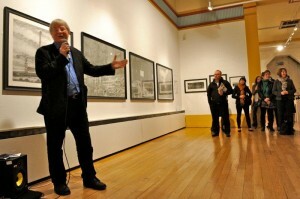 2011 Retrospective at Bilston Craft Gallery. All my leading works about ancient sites, and industrial landscape over the past thirty years. 2012/13 Working at Tholos tombs on Crete mainland. I continue to travel to record as a fine artist the wonderful ancient legacy left for us to wonder at. I also love painting out in Shropshire in all weathers. I have maintained contact with South Korea and intend to travel back there to draw more burial sites on the mainland with the help of Mr Sun Man Kim a great friend who I met whilst working out there in 2005. Lets hope North Korea calms down and things can get back to normal soon. I have recently travelled to many outstanding ancient sites in the Mediterranean. As a young boy I visited temples on mainland Greece and Crete. The pull to go back has always been there so the last few years has been exciting re living a dream and actually drawing out there discovering ancient sites forgotten for many many years, Crete has been an inspiration to me. Northern Cyprus has many ancient sites worth looking at and I have been fortunate enough to go there and work. I continue to draw out in the landscape in Wiltshire and the South West and have recently made a series of paintings about Victorian structures to be found in and around the Ironbridge Gorge. I continue to hand build my printing machines which I love to do. They now sell all over the world, so the dream I had years ago of making printmaking affordable to all artists is working! Etching, drawing painting and making steel etched images combined with press building is a fantastic way to travel through life. Working with my family in our art business makes me so proud. 2012 June – The Queen accepted 60 more ancient site etchings into the Royal Collection! A total of 110 prints reside at Windsor now. 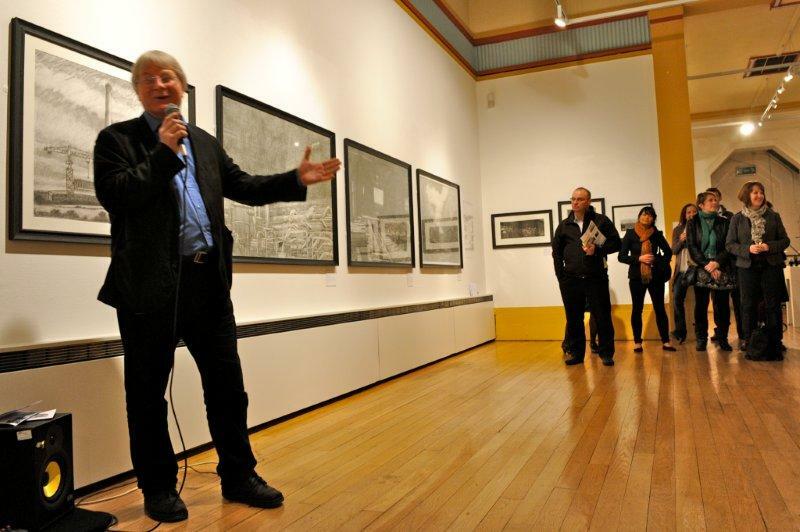 2013 ‘Once upon a time in the Midlands’ at Bilston Craft Gallery [25th May -24th August ]showing Black Country works [ ‘on site drawings’] which tours onto Stafford Art Gallery/ Shire Hall Gallery 14th Sept – 27th October]. 2014 April/May Opening of our ‘New Gallery’ in Ironbridge on the Merrythoughts site in the Old Brewery. We will be the biggest contemporary gallery space in the West Midlands and Shropshire offering changing venues, a state of the art printing studio, conservation framing framing, Giclee printing and rentable studio space for artists. Also new work from the Gunnings, Wow can’t wait!! 2016 Exhibition with David Inshaw and Rob Poutney at Dorchester Museum. Dates to be announced.